The Syncrude tar sands plant and tailings pond at their tar sands operation north of Fort McMurray, Alberta, Nov. 3, 2011. A tailings pond holds all the toxic waste from oil sands extraction process. The so-called tar sands located in the Canadian province of Alberta are estimated to contain the third-largest proven oil reserves in the world, but their expanding development has raised concerns about indigenous rights and the environmental impact. Beneath a vast expanse of boreal forest about 54,000 square miles in area (roughly the size of the state of New York) sit three main oil deposits, containing an estimated 171 billion barrels of crude bitumen -- a viscous tar-like form of petroleum -- in proven reserves. Saudi Arabia has the largest proven oil reserves, 260 billion barrels, followed by Venezuela with 211 billion barrels. But the key distinction is that those reserves are in the form of crude oil. Bitumen, on the other hand, requires a more energy-intensive process to extract, transport and refine. About one-fifth of the bitumen is recoverable through open-pit mining, while the remainder requires more complex (and expensive) “in situ” methods such as steam-assisted gravity drainage, or SAGD, which essentially involves drilling two horizontal wells into a deposit, pumping steam into the upper one and reducing the viscosity of the surrounding bitumen, allowing it to flow into the lower well for extraction. At present, Canada produces about 1.6 million barrels of oil per day from the Albertan tar sands, with most activity focused on the region around the Athabasca River system, where the largest deposit sits. It plans to expand production to 3.5 million barrels per day by 2025. Canada’s total current oil production amounts to 3.59 million barrels of oil per day, the sixth-highest amount in the world. Saudi Arabia produces the most with 11.15 million barrels per day, followed by Russia (10.21 million), the U.S. (9.02 million), Iran (4.23 million) and China (4.07 million). The Canadian government’s intention to continue expanding development of the tar sands is clear, while environmental groups and local indigenous tribes -- referred to as First Nations -- are demanding a halt to oil extraction. “[B]itumen … is turned into oil through complex and energy-intensive processes that cause widespread environmental damage,” Greenpeace Canada says on its website. “These processes pollute the Athabasca River, lace the air with toxins and convert farmland into wasteland. Large areas of the boreal forest are clearcut to make way for development in the tar sands, the fastest- growing source of greenhouse gas emissions in Canada,” it adds. 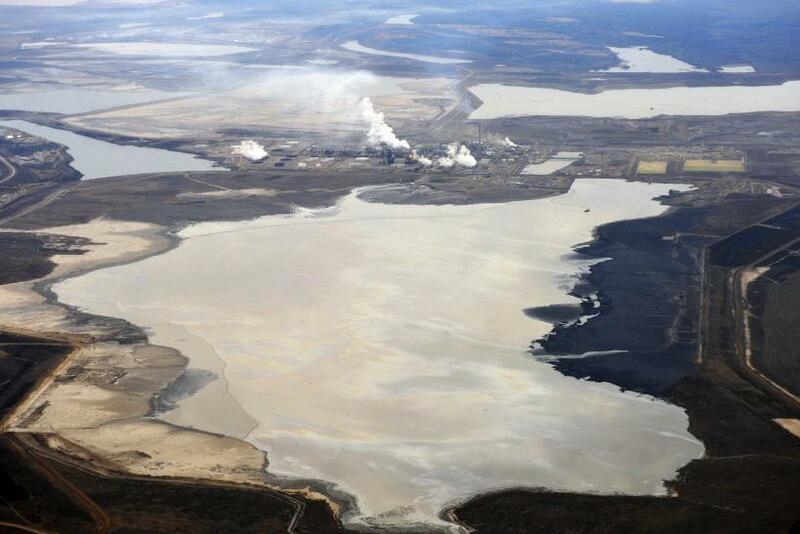 In January an independent environmental study commissioned by the Canadian government examined six lakes near tar sands surface mining sites and found increasing levels of petroleum-linked carcinogens over time in step with oil development. “In this study, with the exception of one lake very close to the oil sands, the levels of these contaminants did not exceed Canadian guidelines and were low compared to urban areas,” said Adam Sweet, press secretary for the government ministry Environment Canada. The head researcher on the study, John P. Smol, a professor of biology at the University of Kingston, said that while current levels were not necessarily harmful, the health risks would increase over time. This host of environmental issues has also affected the First Nations in the Athabasca region. “Expansion of the tar sands in my peoples’ homelands means a death sentence for our way for life, destruction of eco-systems vital to the continuation of our inherent treaty rights and massive contributions to catastrophic global climate change, a fate we all share,” said Chief Allan Adam of the Athabasca Chipewyan First Nation, in a recent statement. While current tar sands development is not taking place directly on First Nations’ land, it has affected the water systems and wildlife that they depend on and consider part of their cultural heritage. Crystal Lameman, a member of the Beaver Lake Cree First Nations, talked about how her people have witnessed declining numbers of caribou in areas near tar sands development sites, which they hunt both for food and as part of their traditions. “We have an obligation to care for these beings,” she added. The Beaver Lake Cree are currently filing a lawsuit against the government, citing a violation of treaty rights which granted them to hunt freely on their land, though a trial date has not been set. Meanwhile, the Canadian government continues to issue permits and approve new projects. Keith Stewart, climate and energy campaign coordinator at Greenpeace Canada, said Ottawa has already approved projects that will increase oil production to 5 million barrels a day, with an additional increase of 4 million barrels in pending projects. “If they’re serious about assessing the environmental impact of these contaminants, then they need to stop approving new projects,” Stewart said. But the gears of industry are already in motion and seem to be accelerating as Canada makes long-term plans for transporting tar sands oil to global markets. In particular, Ottawa is waiting with bated breath for President Obama's decision about whether his administration will approve the controversial northern section of the Keystone XL oil pipeline that would allow Canada to transport tar sands oil down through the U.S. Midwest to the Texas Gulf Coast for export. Michael Levi, director of the program on energy security and climate change at the Council on Foreign Relations, said that the Keystone XL project is the most economically lucrative option for Canada, but its approval or rejection by the U.S. government is not likely to deter tar sands development. “I don’t imagine the Albertan government is just going to sit on top of that oil,” Levi said. Canada’s “Plan B” would be to route the oil through a twin pipeline system, known as the Enbridge Northern Gateway Project, through the province of British Columbia to the Pacific Coast, where it could be exported to Asia. The Enbridge project is currently undergoing environmental assessments but is not expected to move forward until a decision has been made on Keystone XL. “As long as the Keystone option is open, all other pipelines are economically unattractive,” Levi said. While the pipelines will determine how much oil can be transported and thus affect how much can be produced profitably, global oil prices will determine the overall profitability of developing Canada’s tar sands. Professor Bob Schulz, professor of strategic management at the University of Calgary’s Haskayne School of Business, lays out the bottom line requirements for oil producers in three tiers. Companies that are long established (around 15 years) in the tar sands and already have the expertise and infrastructure in place, will need the price of oil to be around $45 a barrel in order to make a profit. Less-established companies (eight years or so) will need the price at $55 a barrel, and companies that are just establishing themselves will need it at $65 a barrel. With the current price of oil at over $90 a barrel, there is no question that tapping into the tar sands will be profitable for Canada. The Albertan provincial government projects will generate over $400 billion in tax revenues for Canada over the next 25 years. "[T]he world will be dependent on carbon-based fuel for the foreseeable future," reads a statement on the Albertan goverment's website. "With the third-largest proven reserves of oil in the world, Alberta must help meet the global demand while ensuring sustainable and responsible extraction." Keystone XL Pipeline - Will It Determine Obama's Environmental Legacy?